The cockpit instrumentation like the airspeed indicator and barometric altimeter are very important to keep flying safe. The cockpit crew can easily identify without calculations the actual airspeed and the altitude of the aircraft while on ground or in the air. An airspeed indicator (ASI) measures and indicates the forward speed of an aircraft. In an airliner or two pilot aircraft, each pilot has a similar ASI and each is fed from an independent pitot-static system. The pitot probe measures the combination of static and dynamic pressure, otherwise known as ram air or total pressure, and the static port measures the static pressure, or known as outside air pressure. In a simple pointer/scale type airspeed indicator, pitot pressure is fed into a barometric capsule which is located in a sealed container rear of the instrument. The important parameter is the dynamic pressure to indicate the airspeed better known as the indicated airspeed (IAS). It is the speed of the aircraft relative to the body of air through which it is flying. The indicated airspeed is of greatest interest to the pilot from an aerodynamic point of view. Critical speeds such as stalling speed or structural limit speeds are constant regardless of ambient conditions. What happens inside the sealed container is, that the barometric capsule expands by the entered air pressure from the pitot probe and drives the linked mechanism which turns the needle on the scale. Some of you will ask how does the ASI technically calculate the dynamic pressure only, if the system is fed by total pressure. I didn’t mention so far, connected to the sealed container is an additional static air pressure line. The line makes sure that the barometric capsule‘s surrounding air pressure equals to the outside air pressure. Let’s imagine you have a piece of paper between your hands and the force on the left equals to the pressure on the right hand side, that means the pressure left hand side = pressure right hand side. But if you increase the pressure of your left hand just quite a bit more than the pressure on the right, let’s say 1,5 pounds vs. 1 pound, than the result (left 1,5 = right 1) is the same as if you are pushing with a force of 0,5 pounds with your left hand only. 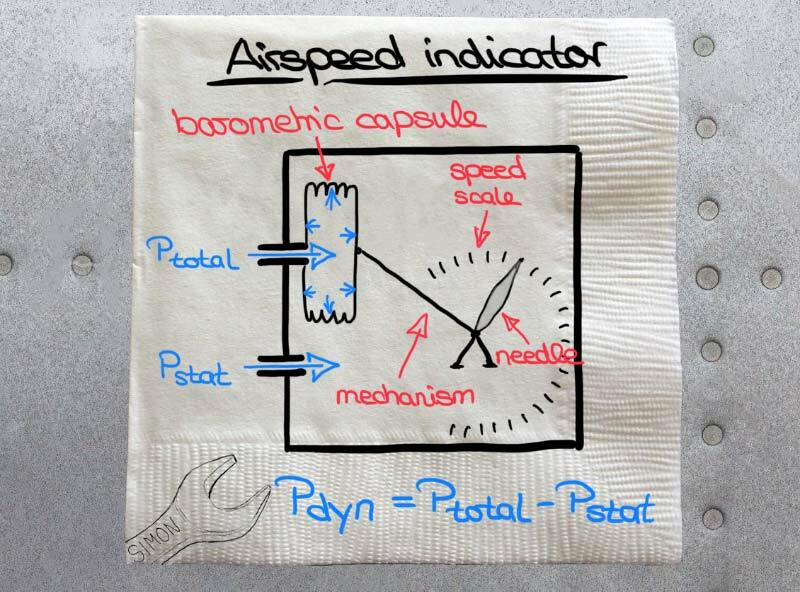 The same principle happens in the airspeed indicator’s sealed container. The barometric capsule is fed by the total pressure, consisting of dynamic and static pressure which pushes against the opposing static pressure and the remaining value is the dynamic pressure only. The two static pressures cancel each other out. In a jetliner with a glass cockpit without any mechanical parts and mechanical indicators it’s quite different. An Air Data Module (ADM) converts the pressure input into digital output signals and provides them for the air data part of the so-called ADIRU (Air Data Inertial Reference Unit). The air data part calculates the speed, corrects them to remove the static errors and sends the speed data to the primary flight display (PFD) for indication of the calibrated airspeed (CAS).